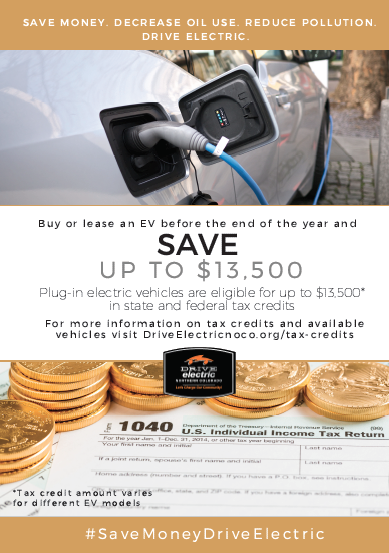 Spread the Word About EV Tax Credits! In an effort to accelerate the adoption of plug-in vehicles into the market there are state and federal credits that make buying an EV an even smarter financial decision than before. As background the first credit available to anyone considering an EV is a federal tax credit of $7,500. In addition, living in Colorado makes this an even better option as the state offers a credit of up to $6,000. Together, these tax credits significantly reduce the cost of buying an electric vehicle – some amounting to a discount of more than 40%. Click the links to the below to share this image to spread the word about EV tax credits, or click the icons below. 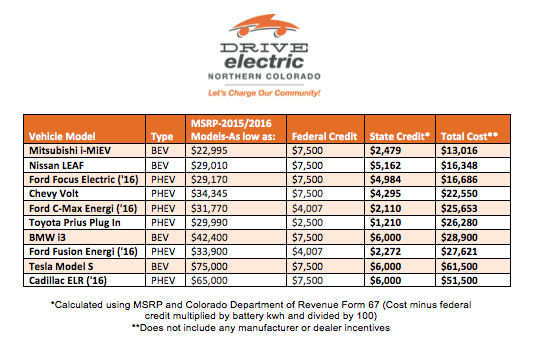 To share the table to the right, which includes the EVs that are available in Northern Colorado and their estimated cost after tax credits, click the following icons. To share the following video, which includes testimonials from EV owners about their experiences applying for tax credits, click the icons below. For information on how to apply for tax credits click here.